Poll: Will you be attending? 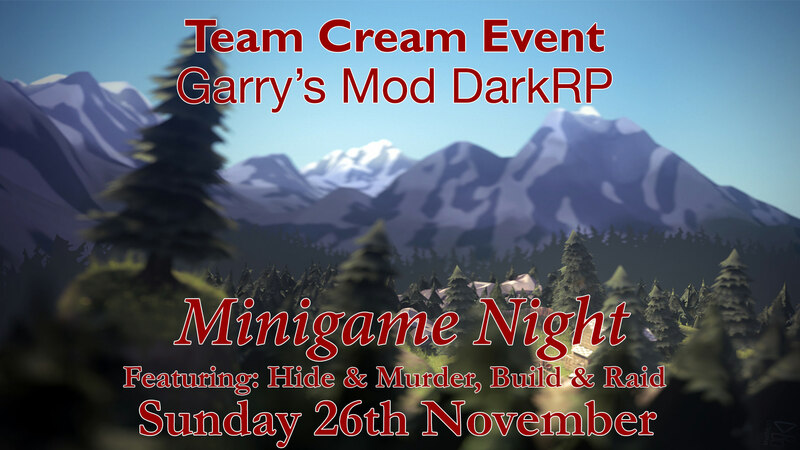 That's right folks, the Gmod server will be hosting a minigames night on Sunday 26th, at around 7PM EST. Like hide and seek, but more illegal! A certain amount of people will be assigned as "Seekers", whom are given weapons to murder the "Hiders"! The hiders will be given a certain amount of time to seek a hiding spot all over the map, after which, the seekers will be released. The Seekers must then murder all the hiders to secure their victory. Once you die, you are free to wander the map until the round ends, as a hobo. The seekers can do whatever they like with you. Also being provided at the spawn is a large projector showing camera highlights during the round, along with chairs you may sit in to get personal angles of the camera's current location. There will be two opposing teams, which must each build a (raidable) base to defend. The teams will be given an amount of time to build the base, after which the teams will be given weapons to fight each-other with. The bases will both have a "Heart" deep within them, that the other team must destroy in order to secure victory. In-game cash will be rewarded to the teams/players who win each game, good for players wishing to get a head-start on playing DarkRP! Once the events conclude, players are welcome to play the default DarkRP Gamemode offered on the TC Gmod server.